Lace 'Em Up For Boston! LEXINGTON, MA (April 23, 2013) − In an effort to inspire runners to honor and support the people most affected by the tragic events that occurred in Boston on April 15, Saucony has created the #BostonStrong Lace Medallion to be offered as a fundraiser for The One Fund Boston. 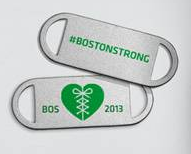 The two-sided medallion features the viral hashtag and unity motto #BostonStrong on one side and a custom-designed, laced-up heart icon on the other. Boston/Portland, April 18, 2013 – adidas, Official Sponsor of the Boston Athletic Association and the Boston Marathon, today announced the launch of a limited edition “Boston stands as one” t-shirt. 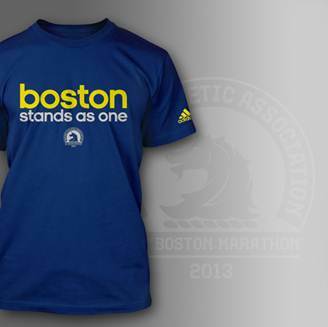 The t-shirt is available at baa.org and adidas.com/bostontribute with 100% of the proceeds going to The One Fund Boston, Inc. in order to help the people most affected by the tragic events. The One Fund Boston, Inc. was announced yesterday to support those affected by the tragic events that occurred in Boston on Monday.